Amazon Price: $126.89 $126.87 You save: $0.02 (as of January 23, 2019 2:35 pm - Details). Product prices and availability are accurate as of the date/time indicated and are subject to change. Any price and availability information displayed on the Amazon site at the time of purchase will apply to the purchase of this product. 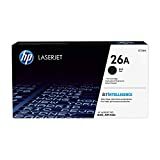 Original HP 26A (CF226A) toner cartridge works with HP LaserJet Pro M402, M426.